7 February 2017 – A brace of 30lbs+ carp and a 95lbs cat out in early February! Matt & Alexandre brave a big winter storm and bank some cracking specimens during a short winter session full of surprises! It’s early February and barely a week since a 5cm ice sheet melted after a long period of freezing temperatures. With a forecast of consistently mild temperatures, big winds and loads of rain forecast it was time to try our luck to bank the first fish of the year. There was very little to go on in terms of signs of fish activity but sometimes when you can’t see anything it tells you what you need to know. I was pretty confident that they were in open water in depths of at least 5ft so I decided to cover this ground with a spread of rods at three different angles from Point ‘C’. The first night was utterly lifeless but I’m very used to blanking regularly during the winter so with nothing else to go on, I stuck to my plan. 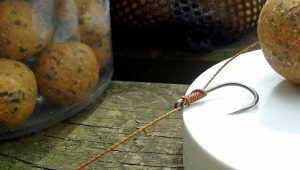 On the 2nd night, I held off putting my rods out until late and drove out three simple traps of 5 whole and 5 crushed 24mm Nutty Banoffee baits with a single 24mm hair rigged as normal to 6” of heavy braided hook link. 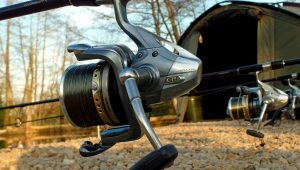 My reels were spooled up with 25lb Big Game (0.48), 40lb and Silcat (0.50) and 60lb Teklon Gold (0.50). After a long dark night of no activity, I was convinced that it was going to be another blank but much to my delight a flurry of beeps from the Delkim signalled a take. 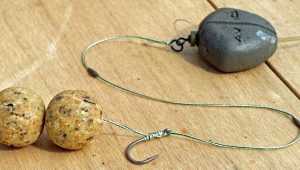 The bobbin was locked up to the top and the fish was already kiting right. After a very spirited fight of some 10 minutes or more I slipped the net under a very nice looking mirror. On the scales he went 31lbs 8oz and made a fantastic start to my 2017 campaign. Later that day Alexandre arrived and in between the showers installed himself in Island Point after seeing some encouraging signs along the back of the island margin. While he got setup, I headed off to the kitchen and knocked us up a Thai green curry for later that night. After chatting through various tactical options, Alexandre and I made our preparations for the night and wolfed down the hot curry just before the heavens opened. Sleep was utterly impossible and the rain absolutely lashed down. I finally got to sleep at about 5am through sheer exhaustion. Alexandre had an early start as he was working that morning but a little sleep deprivation wasn’t going to stop him and he returned just after lunch. The night was a complete wash out on the fishing front but the gravel swims meant we both kept warm, dry and mud free. Un-deterred by the blank, Alexandre and I went for another tour to see what we could see. Again the lake looked lifeless so I suggested that Alexandre move at least two rods to cover the deeper water. 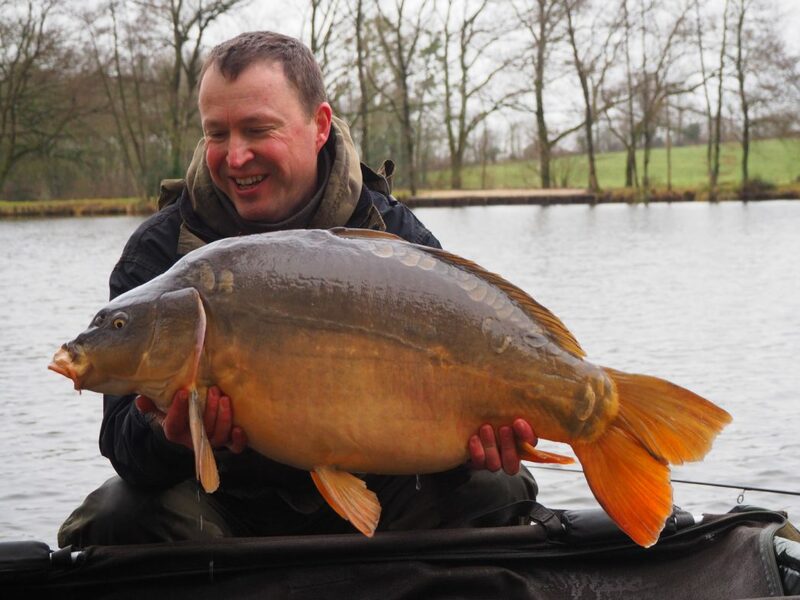 After a few casts with a bare lead, he found a couple of nice areas and made his preparations. I made a few adjustments myself to give him better access to the open water and we settled in for the night. Just before midnight I heard a few beeps drift over the water and wandered round to see what was up. 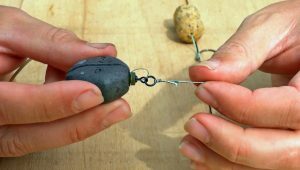 Alexandre was already hovering over the rod and as the bobbin continued to twitch subtly up and down, we both agreed that it was worth hitting and both shouted yes when his rod hooped over as he connected with a good fish. Again it fought very well and we both got an eyeful of a bronzed, scaled flank as I scooped him up. Looks like I wasn’t the only one starting the season well as this one settled the Reuben’s at 32lbs and looked absolutely fabulous! 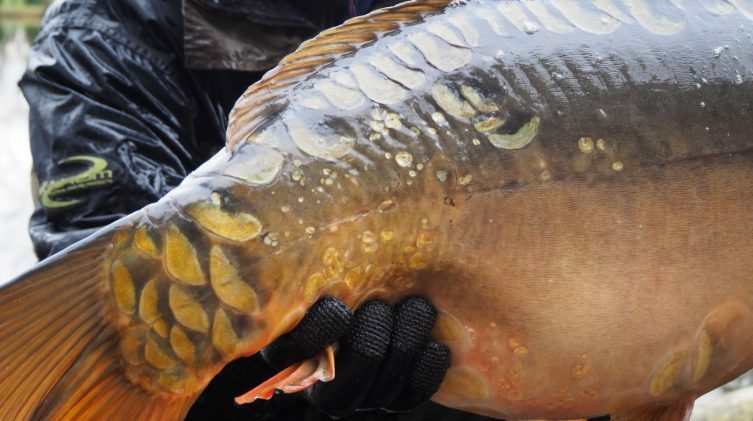 One carp each and it was job done as far as I was concerned but much to my surprise Alexandre was on the phone to me an hour later saying that he was into something…. I wandered round with the camera in no particular hurry when Alexandre said that he thought he was into a cat. When I saw the alarming bend in his rod I had to agree with him as a near unstoppable beast ripped line from his big pit Shimano. My first priority was to get all the catfish handling gear to the swim as we’d only got the carp cradles and slings with us! After a good 30 minute battle, Alexandre had the cat going round in circles under the tip. It’s at this point when it’s easy to lose a big cat as with one thrash of the head they can smash line very easily. I chose to use a standard 42” net to net him as he turned on himself and he went in first time. 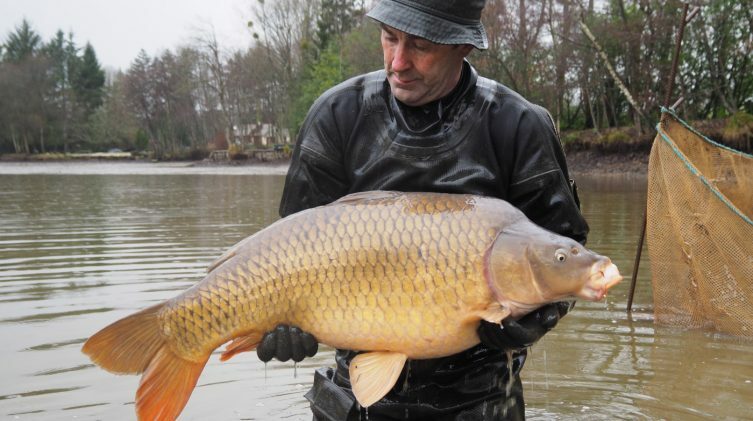 To get the massive creature out the water, I slipped my chest waders on and lifted him directly onto a catfish mat in a big ball while he was still curled up in the landing net. I’ve found this technique to be safe and effective even for massive cats. 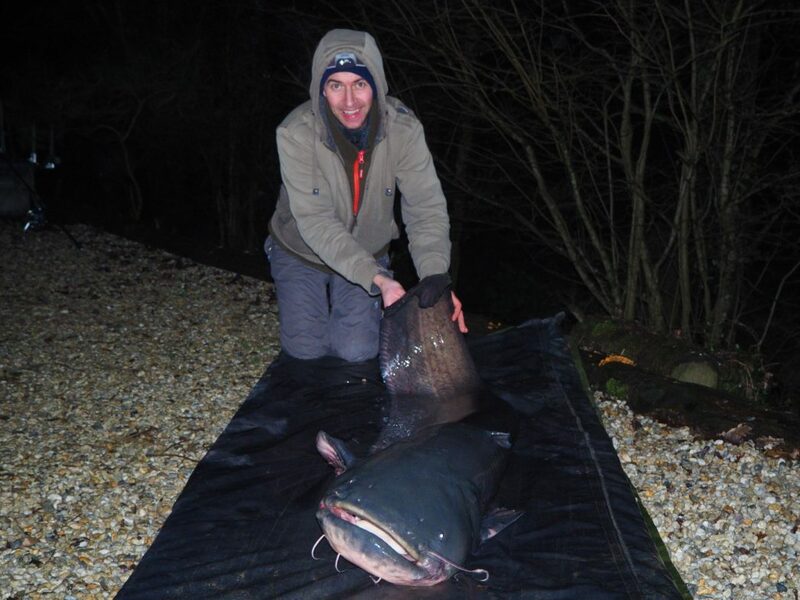 On the scales, he went 95lbs and became the largest true winter catfish ever caught by some margin! It was a great end to our first winter session and we hope to get back on the banks of Beausoleil soon.